The Ruffian On the Stair is the first play by British playwright Joe Orton which was first broadcast on BBC Radio in August 1964. The Irish ex-boxer Mike (Gary Webster) and his wife Joyce (Lucy Benjamin) are getting ready for the day in their flat in Islington, London, in 1967. Even if they could look like a traditional couple, Mike turns out to be a gangster involved in all sorts of crimes, while Joyce is an ex-prostitute who has repeatedly changed her identity. One day a weird but polite young man, Wilson (Adam Buchanan), knocks at their door apparently looking for a room to rent but clearly intent on revenge on someone after the death of his brother. What is particularly enjoyable of this short comedy is the formal and extravagant – sometimes sinister -language used by the characters, despite the tragicomic situations. The plot is quite simple and it is not difficult to understand that Wilson is knocking at the couple’s door with a precise purpose. The three actors give exceptional performances, which captivate the audience in this bizarre story of family secrets. Even if it is quite unrealistic, Ruffian on the stair is an enjoyable, intriguing and grotesque story that gives a good insight into Orton’s work. 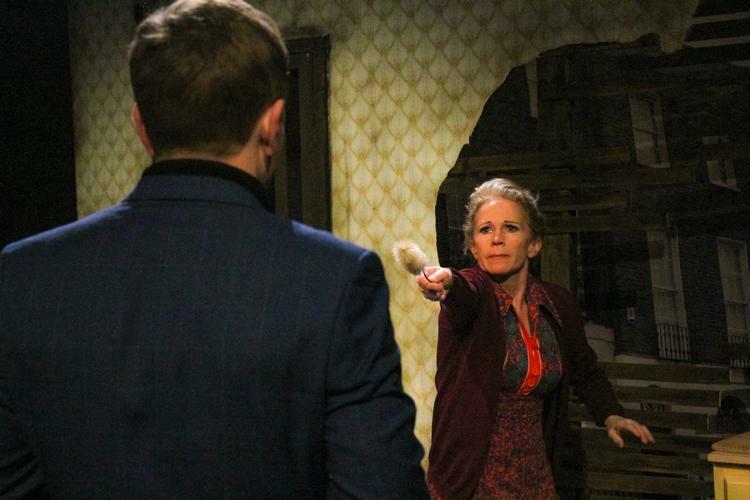 The ruffian on the stair runs until 16 February.